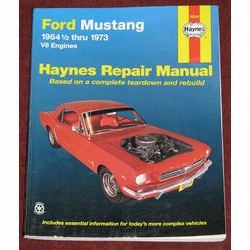 Haynes Repair Manual – Ford Mustang 1964 1/2 thru 1973 v8 Engines. Ok, it Haynes and its the holy grail for many. What more can be said? A lot I hope that is useful, let me explain. Well the manual is paper back and just short of A4 in height. It contains 90 (ish) pages with some photos and they are all in black and white except for the standard spark plug diagnosis at the end. The paper is a little rough and not the best of quality, but as this is a working manual that will get grease and oil on it, at a minimum dirty finger marks, this is not a show piece sales book. There are 12 chapters in all, 1 Engine, 2 Cooling System, 3 Fuel Exhaust and Emission Control System, 4 Ignition System, 5 Clutch, 6 Transmission, 7 Drive Shaft, 8 Rear Axle, 9 Braking System, 10 Electrical System, 11 Suspension and Steering, 12 Bodywork and Fittings. The index works well and there is an excellent section at the beginning with all the recommended tools, conversion charts and original service recommendations. The chapters on the engine and transmission are comprehensive with some good support pictures. How ever the down side is they are black and white and not photographed in top quality, look a little dated and some of the finer detail can be lost in a very busy picture. Don’t let this put you off, the words and step by step are good enough on their own. It’s Haynes, in other words it has ALL the techy information you need and all the stuff you wont need as well. This manual covers lots of options for the years it covers although this is only for the v8 engines, if you have an inline 6 cylinder then this is not for you. I like the way the step by step process is explained and is aimed at the more confident of mechanics with some of the projects. In other words if your brave enough this will tell you how to strip your project down to the last nut and bolt. Some of the sections can be a little short, like removing the heater core for instance, the section doesn’t mention anything about the plenum connections to the bodywork inside the car or the fact the heater hoses have to be re-plumbed back in a certain way. The down side is this manual doesn’t cover the pretty bits in much detail, such as the options available for the interior or how to remove fenders with connecting panels. They are covered but it’s a rather smallish chapter. The only other thing that could do with an enhancement is the Electrical section. The chapter has fantastic wiring diagrams for each circuit. But, as the wire diagrams are black and white it can be difficult to trace some of the wires to and from places. Having said that they work well in general and are spaced out nicely on the pages. It’s an essential purchase somewhere between £12 – £20. The one time you need it you will be glad you own it, but for the weekend tinkerer this may be a little in-depth, or sometimes the more obvious stuff isn’t mentioned. A good buy just for the engine section alone.